From its maker’s aptly named “Glamour Jewels” range is this Remarkable bracelet which is very multi-dimensional & crafted from All Precious Metals. It combines the hues of 3 colours – rose, yellow/green and pink as well as Sterling Silver! Crafted from ALL Precious Metals and with Beautiful, Unique styling, the centrepiece is comprised of a multi-layered petalled flower encrusted with a deep Royal Blue sapphire-like paste stone at the centre encompassed with a rosette of pale blue paste stones. Heart shaped petals and leaves showcase its center superbly. Please enlarge the pictures for the best description of all. The actual bracelet is an expansion type meaning it expands or adjusts to slip over the hand to fit snugly on the wrist. The links expand with a scissor-like action and alternate between a lovely pink gold with decorative & delicate forget-me-not flower embossing and plain pale green gold. The contrast of the colours – rose, pink and yellow/green gold is amazing - they complement each other beautifully. It has the look and silky feel of solid carat gold with the quality you’d expect of Vintage jewellery. It is similar in styling to both the “Carmen” bracelet by the D.F.B. Co. & the “American Queen” by Pitman & Keeler. All of these bracelets are highly collectible. Please note the pictures of the box and sticker are for illustrative purposes only and are not included. Maker: Louis Stern & Company which was established in 1871 & operated until around the early 1950s. They were makers of such things as chains, bags, watch bracelets, knives, buckles & jewellery. There pieces were of excellent quality and this is no exception. Weight: a hefty 35.2 grams! Nearing MINT Antique/Vintage condition! There is no wear, dents damage or repairs evident while there is a little tarnish typical which is exaggerated in the pics, it is able to be thoroughly polished, if desired. Please excuse the yellow fluff caught in the stones - it has been removed since the pictures were taken. It is gorgeous on the wrist. 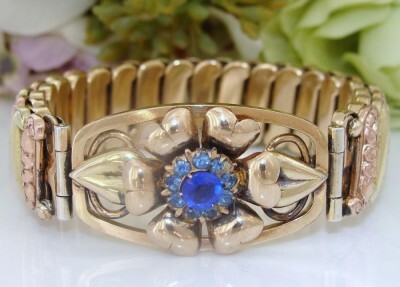 What a beautiful bracelet to be treasured and perfect for Gift Giving.